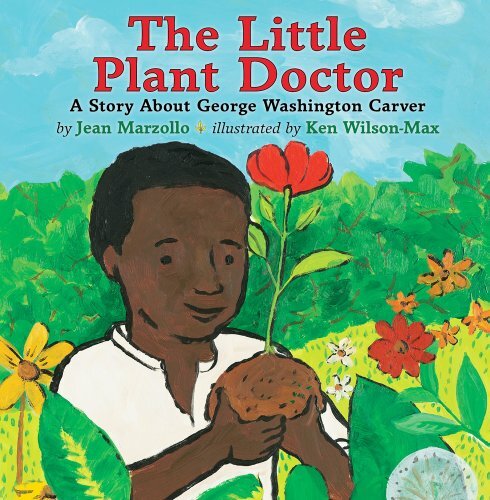 The Little Plant Doctor: A Story about George Washington Carver. Marzollo, Jean (Author) , Wilson-Max, Ken (Illustrator) Apr 2011. 32 p. Holiday, hardcover, $16.95. (9780823423255). 630.92. Told from the viewpoint of a talking tree on the plantation where George Washington Carver spent his young childhood, this handsome picture-book biography tells how the famous African American scientist always nurtured plants and studied them, but the law did not allow black children to go to school. Finally, at age 12, Carver tells his beloved tree the exciting news that he is leaving for school. Today, the tree is part of the national historic site where crowds come to see for themselves where Carver grew up. The fantasy elements distract from the amazing details of Carver’s life. It is Wilson-Max’s beautiful, unframed acrylic paintings that will grab readers with images of the boy with his beloved plants and delighting in books, as well as the clearly labeled images of the peanut plant on the end pages. Extensive final notes with questions and answers for young children and for older readers fill in more fascinating facts about science and history, including the note that Carver discovered more than 300 uses for the peanut.